You may have noticed that Twitter has started hyperlinking hashtags. Those are words preceded by a “#” which denote what the Tweet is about and makes it easier to search for Tweets about specific topics and events. 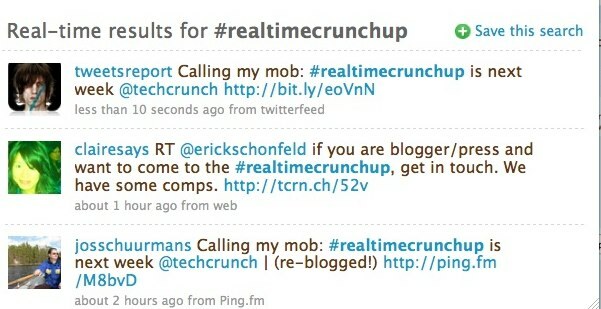 For instance, try searching for #realtimecrunchup. Now that they are hyperlinked, when you click on a hashtag, you are led to the search result page for the specific hashtag. Others have been implementing this; FriendFeed (big surprise) has been doing this for awhile. Some of the Twitter clients, including the desktop versions of Tweetie and Seesmic Desktop also provide hyperlinks to hashtags. For Twitter, search is a navigation tool, and this functionality is yet one more way to allow people to easily discover new Tweets outside their group of followers. This trend started when they added the search box to everyone’s home page last April. Real-time search is heating up. Just earlier today, FriendFeed launched its own real-time search. By linking to hashtags, Twitter is giving people another entry point into its existing search. Now, if you could only track mentions of specific hashtags over time.